Our Szymanski Tree, Lottie's and how they come together. 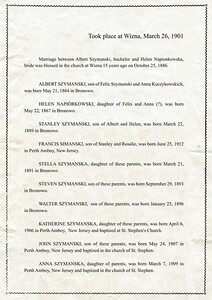 1901 Szymanski family tree that belonged to John Joseph Szymanski, Sr..
1901 English interpretation of the Szymanski family tree that belonged to John Joseph Szymanski, Sr.. It is confusing as to why it is titled "Wizna, March 26, 1901". Clearly it was composed after that date because it refers to the births of the three youngest Szymanski children in 1906, 1907 and 1909 in Perth Amboy, NJ. This belonged to John Szymanski, b. May 24, 1907. Our Szymanski family tree on the left, Lottie's on the right. It is extremely likely we are connected. Lottie's family has records from Robert, their researcher in Poland, that overlap and add to our written family tree. 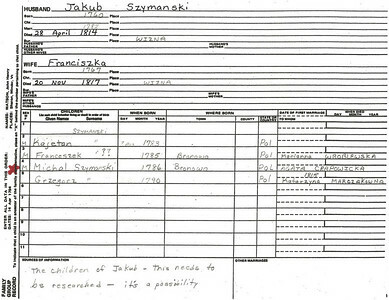 Until recently we were unaware of John Joseph Szymanski, Sr. having resided at St. Joe's Avenue in Trenton. An envelope addressed to him at this location assisted in located him, his mother Helen and his sister Anna, residing at this address in the 1930 census. 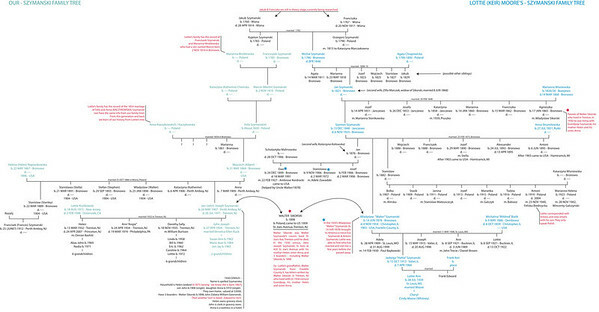 This serves as a solid link between our family and Lotties (see the red "Walter Sikorski" paragraph at the bottom, center of the chart). Lottie's family has letters from Walter at this address, written to her grandfather in Illinois. 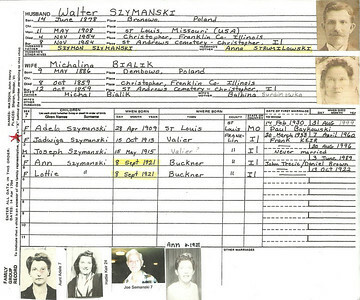 If Walter Sikorski was living with our family, it is likely they were related in some way. 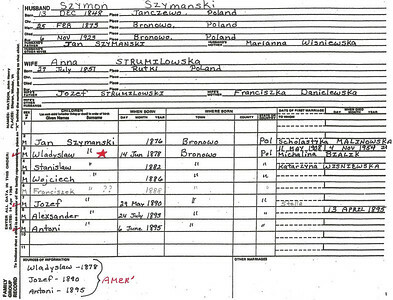 Too much of a coincidence that Walter would be living with a random "Szymanski" family, given his strong connection to it in Poland. Apparently Walter lived at St. Joe's Avenue for the rest of his life. 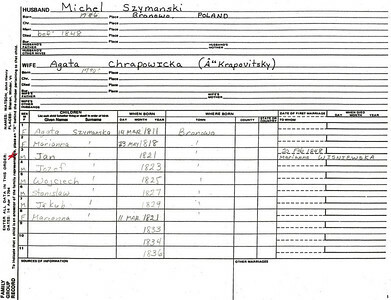 1786 Poland Lottie's family group record for Michel Szymanski. 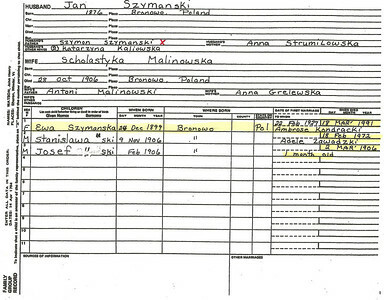 1821 Bronowo, Poland Lottie's family group record for Jan Szymanski. 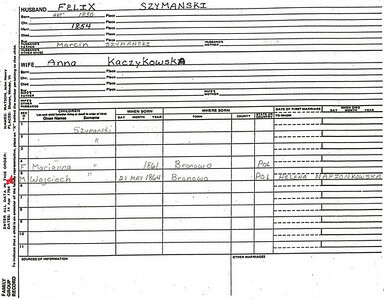 About 1830 Poland Lottie's family group record for Felix Szymanski. 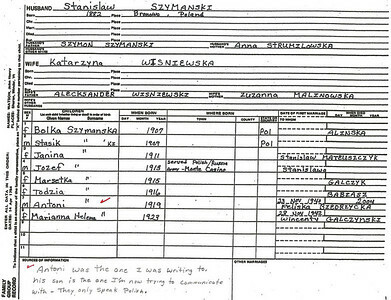 December 13, 1848 Janczewo, Poland Lottie's family group record for Szymon Szymanski. 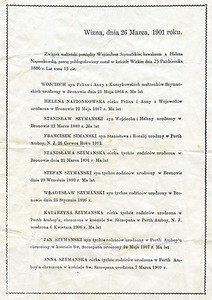 1876 Bronowo, Poland Lottie's family group record for Jan Szymanski. 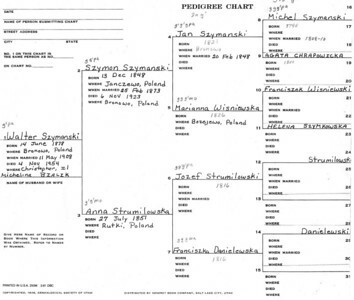 June 14, 1878 Bronowo, Poland Lottie's pedigree chart for Walter Szymanski. 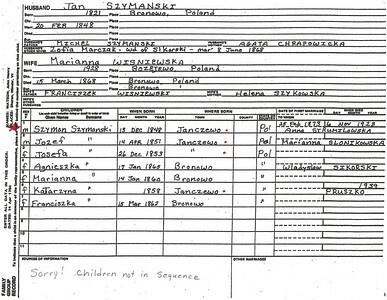 June 14, 1878 Bronowo, Poland (courtesy Lottie Keir Moore) Lottie's family group record for Walter Szymanski.